[PDF] The Trail of Gold and Silver: Mining in Colorado, 1859-2009 (Timberline Books) | Free eBooks Download - EBOOKEE! 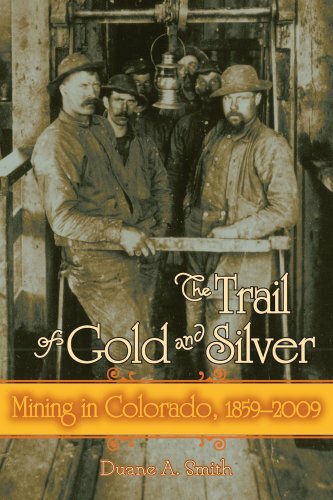 Description: In The Trail of Gold and Silver, historian Duane A. Smith details Colorado's mining sagaa story that stretches from the beginning of the gold and silver mining rush in the mid-nineteenth century into the twenty-first century. Gold and silver mining laid the foundation for Colorado's economy, and 1859 marked the beginning of a fever for these precious metals. Mining changed the state and its people forever, affecting settlement, territorial status, statehood, publicity, development, investment, economy, jobs both in and outside the industry, transportation, tourism, advances in mining and smelting technology, and urbanization. Moreover, the first generation of Colorado mining brought a fascinating collection of people and a new era to the region. Written in a lively manner by one of Colorado's preeminent historians, this book honors the 2009 sesquicentennial of Colorado's gold rush. Smith's narrative will appeal to anybody with an interest in the state's fascinating mining history over the past 150 years. No comments for "[PDF] The Trail of Gold and Silver: Mining in Colorado, 1859-2009 (Timberline Books)".